Somewhere amidst the Rajasthan deserts (this is actually a very small place in Sikar District of Raj.,which still can’t be located on Google Earth atleast, though sounds like Luxemburg, it did not confuse me & I didn’t have slightest of disappointment about it when I got admitted into it ready for an unexpected voyage of 4 long (or short years maybe as it is turning out to be as am traveling into the last half of my electronics engineering)).Mind you this last half sounds short but it actually is 2 years long.By the way ,not only me ,even you if by any chance happen to visit it will find it not just any college as its campus distinguishes itself from any other & please don’t get me wrong am not boasting (that too about my college ,no chance) but you got to admit that its is in short can be described as A VERY BEAUTIFUL CAMPUS . 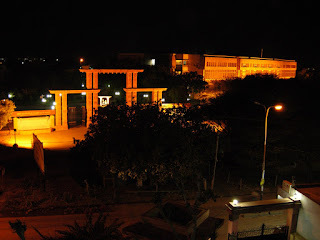 This is the pic of my college gate which I clicked from my friends hostel room as we live outside the campus.Besides,the beautiful campus there are few more things which I have started liking about this small rural place out of nowhere, frankly this was not the case of love at first sight ,especially when you work & dream about some really good institutes of India & end up falling here. I could count about these good points gradually which includes some of the very good labs, the course structure being followed ,the way they evaluate you- a hell lot neck breaking but still comparable to some of the best standards which gives you a feel-good feeling at times as for the other times you are busy getting over with assignment deadlines ,surprise viva, quizzes ,mid terms & the greatest of all end terms which leaves you dark circled sleep deprived ,tortured soul,after all 1st sem gives you a good into about what actually is engineering. Another best part MITS introduced me to-HOSTEL LIFE to be included in the next post. Thanks Swatie...u really write well...nice thoughts....seems like we have more common thoughts then we thought.